N-Scale for the Discriminating Modeler! New releases are included below. Not all items can be in stock at all times. and shipping charges we "bunch" up re-orders to save you money. but the information is provided for reference purposes. Please remember to give your first and last name and preferably at least the city and state where you live in all your e-mails. Non-USA customers please include the country. Please copy & paste the entire description line (no pictures please) from the item you are ordering into your e-mail. With the quantity of lines we carry it's not possible to memorize all of them. Toltec Images sells high quality: hats, mouse pads, placemats & denim shirts. The EMD GP18 was not a revolutionary locomotive. 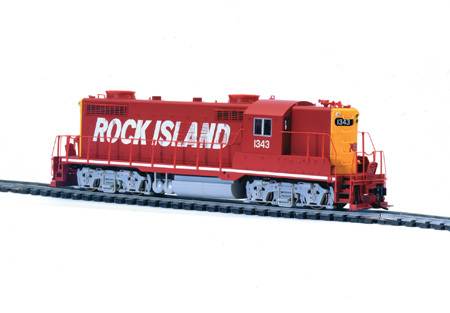 It evolved from the proven and successful GP7 and GP9 locomotive designs, keeping the best of their features and adding important new options of its own. Increased power was one of the main selling points, with the GP18 getting 1800 horsepower out of its non-turbocharged 567D1 diesel, compared to only 1500 horsepower for the GP7 and 1750 horsepower for the GP9. The most innovative design feature of the GP 18 was not introduced until near the end of production: The GP18 was the first EMD locomotive to be offered with a low short hood, a big improvement in cab visibility for the crew. While these innovations were important, versatility was what made this locomotive successful. GP18s could handle a full range of duties, from switching to transfer runs to mainline work, passenger or freight. Among the many options offered were steam generators for passenger service, winterization hatches for improved cold-weather performance, dynamic brakes for maximum braking on steep grades, and a variety of fuel tank sizes to suit operating conditions and axle loadings. EMD produced 388 GP18s from 1959 until 1963, with American railroads purchasing 350 units and Mexican railroads ordering 38. Replaced by the turbo-charged GP20 and the uniquely styled GP30, the GP18 was not as innovative as the locomotives produced before or after it. But when you measure the GP18 by the standards of versatility and usefulness, this was one of EMD’s most successful locomotive designs. taken by Jim Rasmussen on 9/24/78 in Des Moines, Iowa. Thanks Jim for the shot!